Privilege is without question one of the most misunderstood terms today. And that misunderstanding is not new — it’s been with us for generations. It is strange that in a nation that is founded on the principles of fairness, equal rights, and equality, there is more dissent about privilege than in almost any other nation in the World. The cries against privilege became deafening in the last decade or so led by louder and louder cries against racism — real and perceived. The controversies of privilege were placed front and center in America with the election of the first black President. Many African Americans as well as white Americans hoped desperately with the election of Barack Obama that the concept of privilege — social, economic, ethnic, and political — would be put behind us. Sadly that was not to be in spite of attempts early in his presidency to push that plan forward. Not only did it fail, it failed miserably. Why? Privilege is not the same and does not evolve from the same origins in every country. Social and economic factors as well as historical events amid varied cultures within each nation weigh heavily on the realities of privilege. While running water and separate bathrooms are considered standard in most countries, in others only the most privileged citizens enjoy those luxuries. A college education is taken for granted in Country A while in Country B a young person’s attending college is a rarity — a result of privilege reserved for only a few. 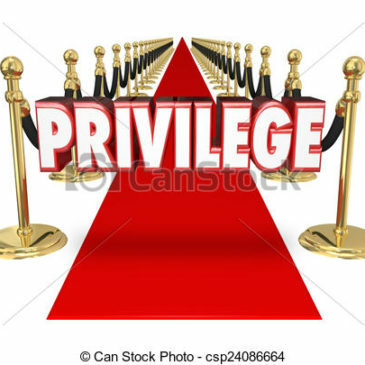 In the U.S. in the last few years, privilege has been confused with entitlement. That happening has really muddied the realities of social, racial, economic, ethnic, religious, and national status for many. Because of the massive misunderstanding (or misinterpretation) of privilege, an alternate thought process has not only taken root, it has rapidly taken over the mindset of millions of Americans. It is “entitlement.” Entitlement is defined by Webster as belief that one is deserving of or entitled to certain privileges. By that definition, the mindset of entitlement has caused large groups of Americans to draw proverbial lines of separation between their groups and groups of other Americans simply because of those sometimes real but sometimes only perceived feelings of unfair inclusion in specific groups. There are many dangers associated with these feelings and the creation of subsequent groups even if they exist only through perception. People STILL make decisions — often life-changing decisions — based on those perceptions. Example: animals often show a proclivity to accept perception as reality. We’ve all seen the mother cat who adopts an orphaned piglet as her kitten. She treats it as hers: nurses, cleans, includes it in everything with her biological kittens. That piglet really feels it is not just “A” kitten, but “her” kitten. As a natural feeling from those circumstances, that piglet feels entitled to the same rights and privileges as those kittens. Here’s the danger of this in today’s America: “Perception IS reality.” What do I mean? In many cases in life, human beings meet people in various social settings. When that initial meeting and subsequent meetings happen, both people draw conclusions about the other based on conversations, shared life details, social and economic settings, etc. Unfortunately many times those conclusions are not factual. Without really “knowing” someone, it is impossible to be certain about that person’s real character and how it is comprised. But human nature always takes over and guides us to judge that person based on our perceptions. (Remember: “perception IS reality”) That usually includes placing that person into a pre-determined group with others we “perceive” to be like them. We make decisions based on our perceptions of who those people are and what they think, whether or not our perceptions are correct. Too often our perceptions based on inaccurate thoughts force us into an entitlement attitude, especially when we feel that person is better off, smarter, more attractive, more privileged than we are. Today’s best example may be that of Surgeon and current Secretary of Housing and Urban Development Dr. Ben Carson. Dr. Carson grew up in rank poverty in Detroit, trapped in all of the negative circumstances that accompany pretty much everyone that grows up in poverty in Detroit. His mother — Sonya — had just a third grade education, and as a devout Christian person prayed diligently for Ben and his brother Curtis to get good educations. Ben had a voracious hunger for knowledge that drove him to graduate high school with honors and entry into Yale where he pursued a degree in Psychology. He then went to University of Michigan and saw his interest change from Psychology to Neurosurgery. After medical school he found himself at John Hopkins in Maryland where at age 33 he became the youngest physician to ever head a major department at John Hopkins. He became the director of pediatric neurosurgery at the Johns Hopkins Medical Institution, a position he held from 1984 to 2013, and a professor of neurosurgery, oncology, plastic surgery, and pediatric medicine. In 2013 he left to pursue politics as a presidential candidate in 2015-2016. That’s quite a success story. But yet there are many Americans who bear anger and resentment for Dr. Carson: he’s a sellout, a “Uncle Tom,” the White Man’s token, a medical Token Black, a racist, and on and on. Even though he served at John Hopkins for 30 years with an exemplary record as a neurosurgeon, many in the liberal community summarily reject any and all of his personal and professional successes because they have relegated him to be part of a group of people who became who and what they have become for one reason and one reason only: privilege. Ben Carson is African American. African American young men who grow up in Detroit cannot possibly achieve the successes in medicine as did Ben Carson unless…..unless…..unless. Unless what? They are privileged and because of their privilege they are able to step to the front of the line, take short cuts, get a pass, break all the rules, etc. Their successes cannot possibly come from hard work in school and diligence in their chosen professional field. And that rule applies even more to Dr. Carson because he is black. The conundrum today in which Dr. Carson finds himself is exacerbated because of our first African American President. 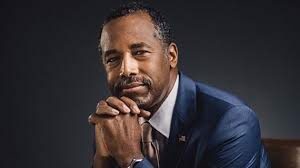 The hatred by many for Carson is because Barack Obama is an extreme left-leaning liberal while Ben Carson is a very conservative non-political American. Obama had marginal at best educational success, a very sketchy professional career before running for state office in Illinois and then his short tenure in the U.S. Senate. He has no traceable childhood story remotely comparable to that of Carson that documents amazing self actualization, pulling himself out of a sure fate of failure common for most poor black Detroit adolescents. Ben Carson never had privilege in any area of his life. And he was fine with that. Dr. Carson is being lambasted by the liberal lefties simply because he used realistic comparisons for some Americans that liberals find politically “incorrect,” especially since he is African American. “I think poverty to a large extent is also a state of mind,” Carson said in a SiriusXM radio interview with Armstrong Williams, a top adviser to Carson’s 2016 presidential campaign. “You take somebody that has the right mindset, you can take everything from them and put them on the street, and I guarantee in a little while they’ll be right back up there. And you take somebody with the wrong mindset, you can give them everything in the world, they’ll work their way right back down to the bottom,” the neurosurgeon continued. The former GOP contender also referred to a “poverty of the spirit” and a “wrong mindset” that can develop from inadequate parenting and a negative environment. How dare an African American in such an important position as Secretary of HUD say something so outlandish! It makes no difference to the Left if what he said is true. All that matters is that he is ignoring the “fact” that in the communities of poor in the U.S., those caught there are there because of the privilege of others that have forced those poor to stay where they are. Of course that is not fair, because their being poor is not of their doing and they are therefore entitled to privilege. Of course not all think that is so. But isn’t it obvious that many on the Left today feel that if anyone from a minority community works their way to a point of success in whatever endeavor they choose, the only reason they get there is because they somehow cheated the laws of Privilege and Entitlement? While on the opposite end of the spectrum, millions of American do not ignore their foundations, but choose to take the best of their foundational circumstances and through hard work and selflessness create and/or find opportunities they can parley into successes in their life using what they have learned. We all know people who are born privileged or live in privilege because of circumstances that benefit them that they had no input into. Some of them build from those and find amazing successes. Others turn out worthless with nothing to show for their early privilege. Then there are those who start with nothing and horrible life circumstances, (like Ben Carson) who find ways through hard work to pull themselves to the top, while they watch others who come from the same exact environment who stay in that place for their entire lives and finish with nothing to show for their life’s work. Privilege has no color, no ethnicity, no racial or religious tone. Privilege comes from a multitude of circumstances that are usually uncontrollable — at least at inception. Entitlement comes from a skewed perspective of life reality and is almost always a product of putting oneself in a group and looking across the city or neighborhood or school playground and seeing others that perceptually are put in a separate group. The Educational Institutions of this United States of America need This as a Required Study in the Worst way. Privilege is not owed but earned through Faithful Fidelity to Fulfilling One’s Responsibilities and Destiny before God & man with Excellence and Distinction. I’m amazed, I have to admit. Rarely do I encounter a blog that’s both equally educative and entertaining, and let me tell you, you’ve hit the nail on the head. The problem is something not enough people are speaking intelligently about. I’m very happy I came across this during my search for something regarding this. Hi, everything is going fine here and ofcourse every one is sharing facts, that’s really excellent, keep up writing. I like what you guys are usually up too. This sort of clever work and coverage! Keep up the good works guys I’ve included you guys to my blogroll.